For customers with special requirements our team of experienced physicists and engineers can design and build complex and sophisticated cryogenic systems. 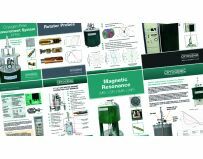 Recent examples include a fast ramp 7T cryogen-free magnet that can be energised at 1 Tesla/sec, powerful vector magnet systems for XMCD measurements and dilution refrigerator systems for low temperature STM measurements. With knowledge built up over 30 year of manufacturing custom cryogenic equipment our sales and technical staff are always happy to discuss customer requirements..